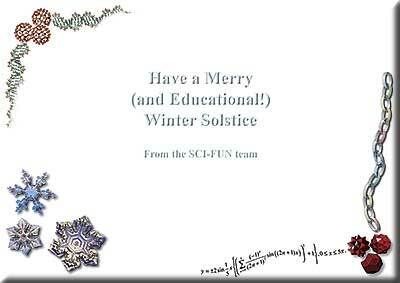 Click here or below for more information on the Winter Solstice. The right-hand page has pictures of the only real snowflakes on the entire card. (Click on the images here to see larger versions.) 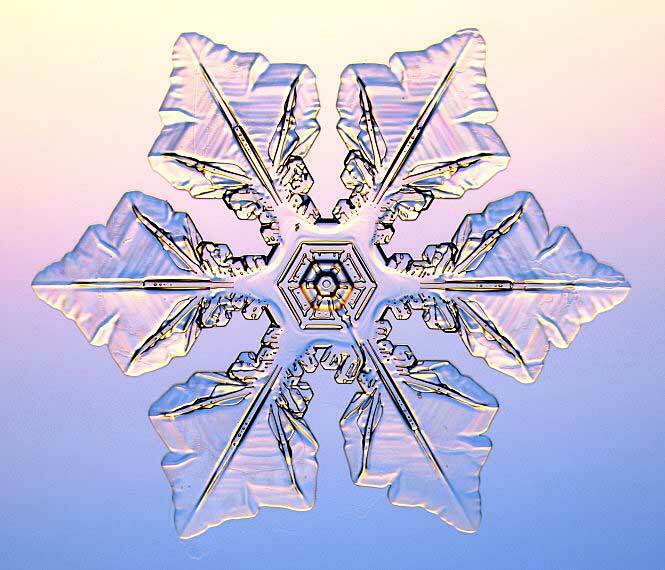 These beautiful images, from the extraordinary site SnowCrystals.com, are of real ice crystals, photographed using a special technique described here. 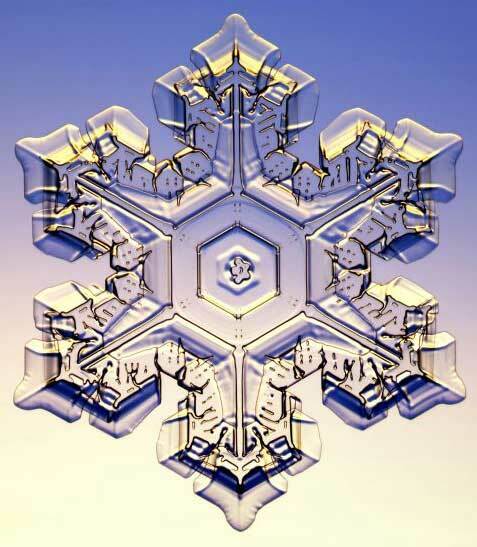 The site has a wealth of information on the physics of snowflakes, how to photograph them, and even on how to grow artificial crystals. 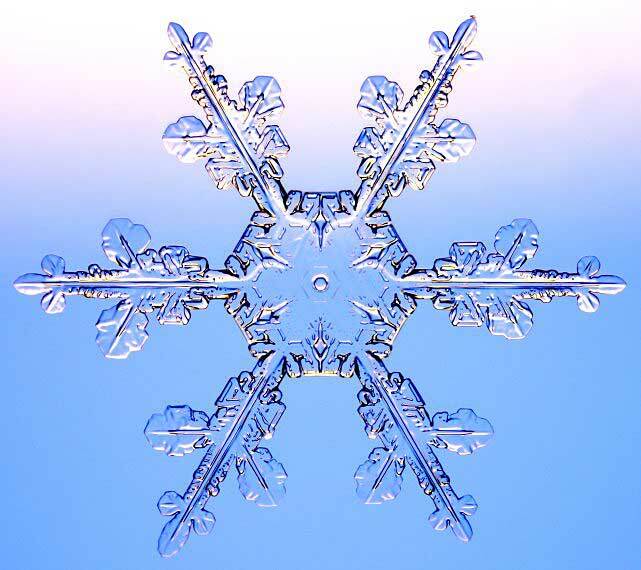 The three snowflake images above and on the card are the copyright of SnowCrystals.com, and are used with permission. 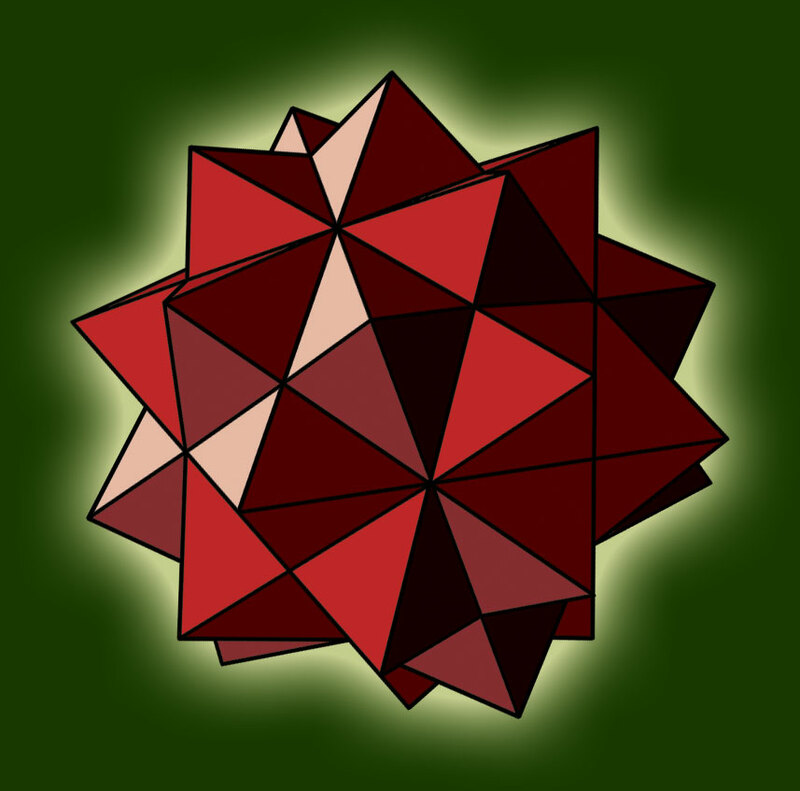 The mathematical berries at bottom right are three polyhedra (the images for which are from the mathworld site, coloured red for Christmas). 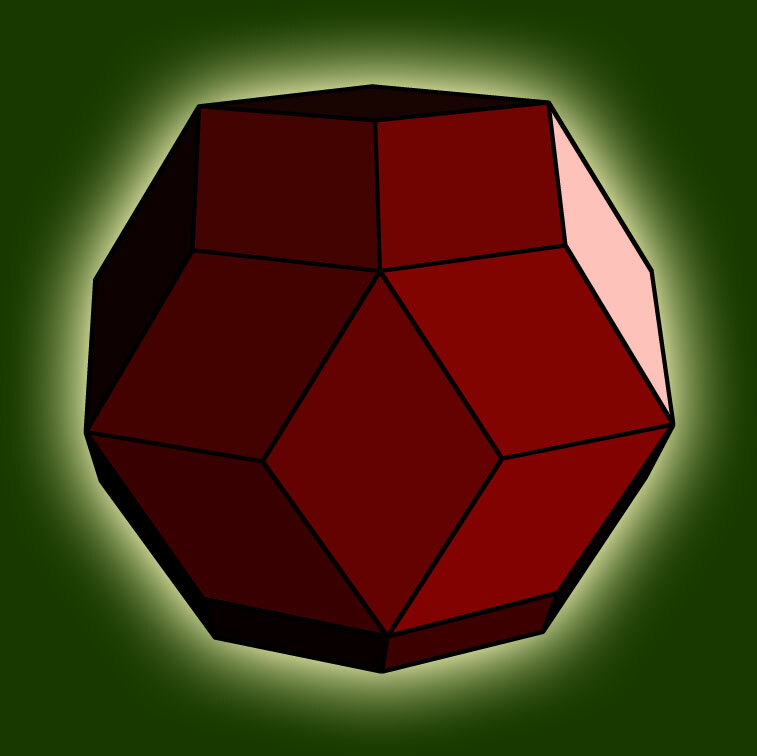 The first is the intersection of five octahedrons (solids made from eight equilateral triangles); the second is the intersection of a dodecahedron (made from ten pentagons) and an icosahedron (constructed from twenty equilateral triangles); the third is made from twenty rhombuses [mathworld prefers 'rhombi']. Click on the compound names below for more information on each solid, including an animated version (or on the thumbnails themselves for a larger image). The polyhedral images above and on the card are the copyright of mathworld.wolfram.com, and are used with permission. You might have noticed that the central(ish) link in our Christmas paper chain (remember making them at school?) is different from all the others. It's a Möbius strip: a one-sided object (shown on the left), which of course can only have one colour, unlike all the other links. (Try following the surface of the shape, to see that there is only one edge and one surface...) The strip is created by twisting one of the ends, before joining them together. It's not simply a mathematical curiosity. In the early 1970s, a möbius conveyor belt was built which minimised wear by using 'both' surfaces of the rubber. And some tape loops were designed in this way to double the recording time! A variety of molecules have also been synthesised with möbius properties, although (as far as we're aware) no specific chemical benefits result from the structure. 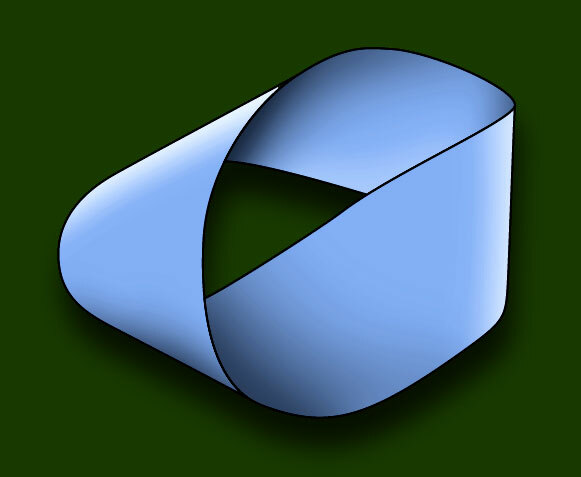 There's a nice Java animation of a mobius strip at this mathworld page. The Dutch artist M.C.Escher made two woodcuts using the idea of the möbius strip; the images and links opposite take you sites where you can see larger versions of the works. Until 1985, any chemistry textbook would have told you that pure carbon exists in two basic forms: diamond, in which the atoms are arranged in a tetrahedral structure (giving it its amazing strength); and graphite, in which layers of hexagonally-linked carbon atoms are only loosely connected (allowing sheets to slide over each other, making the material soft and slippery). And then (as described here) Curl, Kroto and Smalley discovered a new form, a stable molecule with sixty atoms... The only way in which these atoms could combine was as the football shape shown opposite, which exactly mirrors the old-style leather footballs, mixing hexagonal and pentagonal panels. Because this structure was also found in the design of a geodesic dome built by the architect Buckminster Fuller, the molecule was named buckminsterfullerene,* usually shortened to fullerene (or buckyball). Fullerenes exhibit some remarkable properties, such as superconductivity; indeed, they may prove to superconduct at higher temperatures than the best of today's ceramic materials. 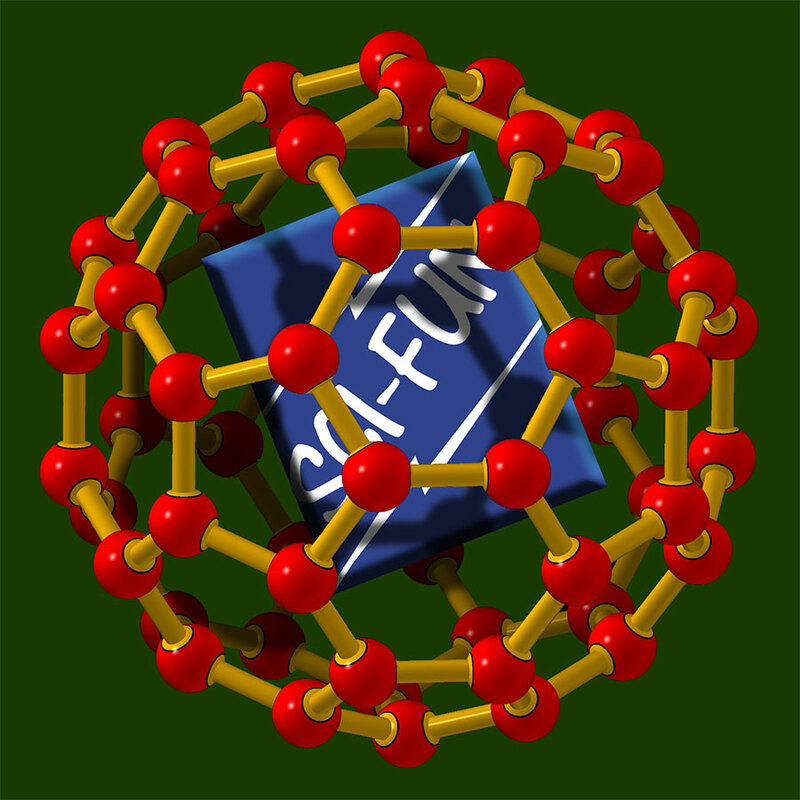 By attaching other atoms to the carbons, a fuzzyball can be created; materials made from fullerenes attached to fluorine atoms will (it's believed) produce a slicker compound than teflon, currently the solid with the lowest coefficient of friction. 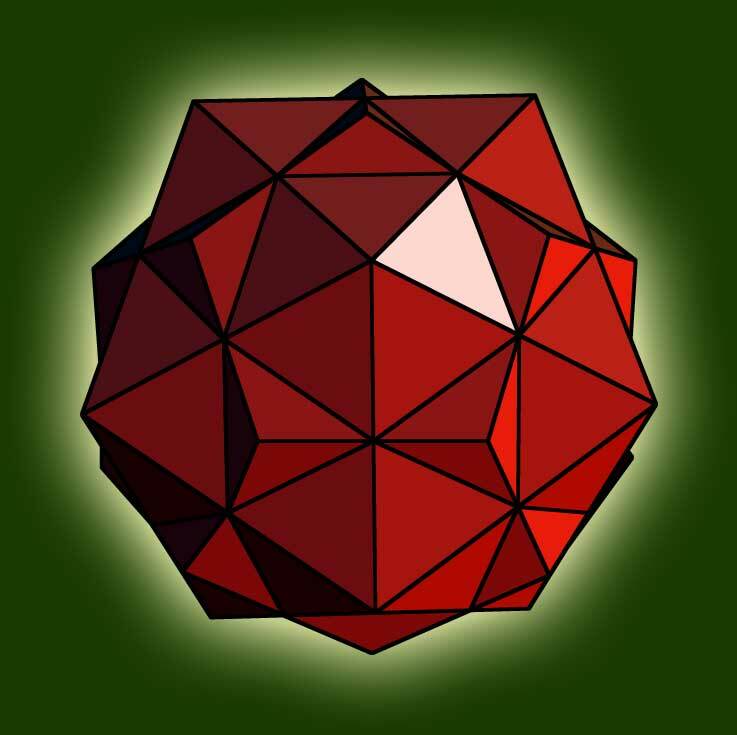 Other atoms can be trapped inside fullerenes (a bit like our logo above); recent evidence for a meteor impact at the end of the Permian period was found by analysing noble gases preserved within the molecule. One avenue of research involves using fullerenes to help in the targeting of drugs within the body. "The buckyball, being the roundest of round molecules, is also quite resistant to high speed collisions. In fact, the buckyball can withstand slamming into a stainless steel plate at 15,000 mph, merely bouncing back, unharmed. When compressed to 70 percent of its original size, the buckyball becomes more than twice as hard as its cousin, diamond." – from "The Buckyball", a fascinating article by Rodrigo de Almeida Siqueira. There have recently been concerns raised (sensible ones, as opposed to Prince Charles type, Michael Crichton-inspired 'grey goo' worries) that nanoparticles may pose considerable environmental hazards. The physical properties  and potential biotoxicity  of nanometre-scale non-biodegradable objects are currently under investigation. 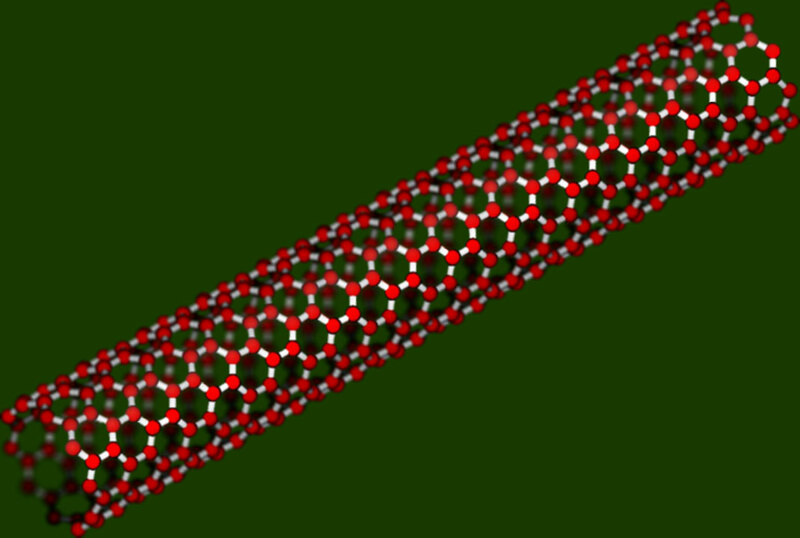 The Nanotechnology Now site has extensive information (and a huge section of links) on fullerenes and nanotubes.